Be a proactive Tiger by volunteering! Your volunteer service completed between April 18, 2018 - April 15, 2019 not only helps your community, but it also earns you recognition and rewards! 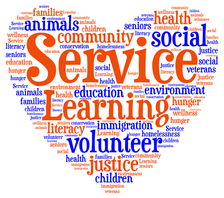 Students that complete 10 or more hours of volunteer service with receive a Community Service certificate. Hours must be logged in the student's Leader In Me service log and turned in by April 15, 2019. Students age 5-10 years old that record 26 or more hours and students age 11-13 years old that record 20 or more hours will be eligible to receive an official President's Volunteer Service Award (PVSA) certificate and pin at the THE Community Service Awards Ceremony. For students turning 11 years old during the award year, volunteers will be awarded for the age they were for the majority (at least 7 months). Any student who turns 11 years old after November 18th will qualify at the lower level for ages 5-10 years old. Service hours must be logged on the PVSA website by April 15, 2019 for the PVSA Award. Click "Get Involved" and select "volunteers" from the drop down menu. Click on "Register" (blue box on right side of page) and enter the requested information. You will receive an email to confirm and activate the PVSA account. Once activated and you are logged in, you will need to add the Tuscany Heights school code. Go to "My Profile" (blue box on right hand side of page) and scroll down to "Record of Service Key" and click "edit"
Enter QMT-49670 for Tuscany Heights and the school information will populate. All Leader In Me service logs must be turned into the Front Office and PVSA hours must be logged into the PVSA website by April 15, 2019.